It was once said, by that grand dame of American etiquette Emily Post, that knowing how to properly enter a drawing-room is one of the surest tests of good breeding. As with all matters pertaining to manners, there are very concrete dos and don’ts when it comes to public presentation; intricate constellations of behaviors that suggest good deportment and upbringing. For instance, it is common knowledge that a woman does not simply enter a room where friends and acquaintances are gathered. Rather, she is expected to pause upon the threshold of the room and ascertain first where the host or hostess is situated before entering. It would be quite embarrassing for a lady to walk headlong into a room only to realize shortly after entering that she had no earthly idea where the party’s hostess was. To do so would mean being forced to stand out all by her lonesome like a stunned gazelle straggling behind the herd, frantically darting her eyes back and forth in search of the woman to whom social decorum mandated she pay her respects. By and large, this obsequious adherence to the niceties of proper etiquette, which was the norm for the aristocratic and upwardly-mobile set in Ms. Post’s day, has vanished. Some may lament the lack of attention that is given today to such proprieties, but any laxity of manners that has taken place over the past half century has merely been the trade off of obtaining a measure of gender equality in America. Now that women are CEOs and Secretaries of State and leaders in every profession under the sun, the amount of time they spend practicing the proper way to walk across a ballroom floor has diminished significantly. That’s not to say that Madeline Albright or Marissa Meyer don’t know how to properly cross a ballroom floor, but that they have bigger fish to fry. With that being said, there is still a small subset of the American populous that still cling dearly to the WASPy pretensions of their forebears and, a few months back, I was fortunate enough to view a family of them in one of their natural habitats: New York City’s Financial District. I had stopped for a coffee at a Starbucks that sat at the corner of Broadway and Thames St. on the ground floor of the more than a century old Trinity Building. 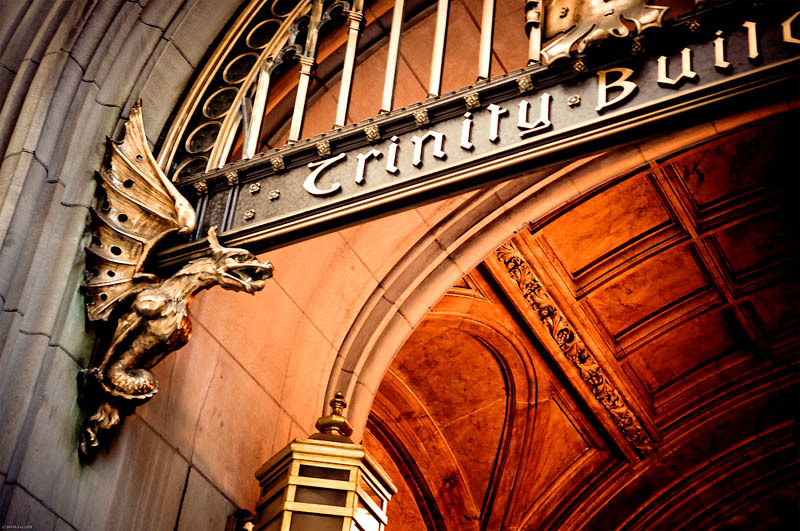 With its gorgeous neo-gothic facade and gilded interior design, the Trinity Building lent an air of class and sophistication to this particular store that one would not have seen at a Starbucks situated in the concrete redundancy of a strip mall. Of course, in exchange for the ornate architectural splendor of the store’s surroundings, the Trinity Building Starbucks had to give away a lot in terms of open space and seating. In response to these constraints, this Starbucks had eschewed the chain’s normal setup of small, evenly spaced pedestal tables and installed a series of long dining tables, which could accommodate more customers, but would require them to sit side by side one another. A few minutes later, the woman’s similarly constituted husband and son came in and exchanged a few brief pleasantries, not least of which was the husband giving his wife a platonic and utterly sexless cheek kiss that seemed better suited for greeting a mother than a spouse. For his part, the son—who looked like he was still a teenager, but was probably in his very early twenties—barely so much as looked up from his smartphone while greeting his mother, his eyes fixed at a 45 degree angle at whatever was on the screen in front of him. Both men were wearing navy blue suits, although the son had decided to imitate a Tommy Hilfiger model by taking the jacket off and slinging it over one shoulder at a rakish angle, exposing a pair of expertly rolled up shirt sleeves that had been fastened to the usually superfluous buttons affixed on the lower part of his biceps. The son had strategically tousled his sandy brown hair, which was just long enough to acknowledge his youth, but not so long as to suggest any sort of rebellion. The father’s hair was shorter and tidier, with a slick, silvery hue of a man who uses a fair amount of product in the morning. Like counterbalancing weights on a fulcrum, the wife stood up as soon as her husband and son sat down next to her and across from me. “Would you boys like anything to drink?” she asked them. There was no response, so she simply continued on as if there was. Once again, there was silence. And, once more, the woman continued on, taking off her sunglasses and placing them on the table. The husband nodded imperceptibly as his wife walks up towards the counter. About half a minute passes before either he or his son make any further attempt at conversation. “How did the meeting go this morning?” the father asked him, staring down at his smartphone. “It went pretty well, I think,” the son replied, also staring down at his smartphone. “3:30”, the son told him. The two men were quiet for a time as they waited for the unease and tension to ratchet back down to a manageable level. Each went back to fiddling about with their smart phones and it was another couple minutes before the son spoke up again. Before the son had a chance to come back with a retort of his own, his mother came back from the counter with a large iced tea and a look of abject revulsion on her face. A silence descended on the family again as the mother picked up the iced tea and placed it in front of her son. The mother paused while her son took a sip from the iced tea. Shortly after that, both the father and the son stood up without saying a word to one another and headed towards the exit. The mother took a few more seconds to put her sunglasses back on and put her ipad in her purse before she followed suit. They left their barely touched iced tea behind. After all, one does not throw away one’s own beverage in a cafe or restaurant. That’s what workers are for.